Member News, Whirlowbrook Hall Event Report, West Haigh Event Report, Shirebrook Event Report, SYO hoodies, Club Night, Coaching, New Club officials co-ordinator, Millhouses Event, WOD Event, Sandall Beat Event Report, T'shirt participation Update, GDPR, Northern Champs Report. A very warm welcome to new members Emil and Maya Howell. Good luck to the 58 SYO juniors competing on behalf of the club at the Yvette Baker Heat on Sunday. This event will be the penultimate event in the 2017 / 18 schools' and newcomers' series. Alongside the normal white to long orange courses, there will also be a light green course and a 30 minute odds and evens score. The long orange and light green courses also use Hutcliffe Wood, the map of which has been newly updated by Ian Cooper for this event. We will be based outside the cafe as usual. Registration and start are open 12:30 to 3:00 with courses closing 3:30pm. Full details here. As usual volunteers are required. We are expecting it to be busy as Millhouses is always a popular location and the weather forecast is good. Please email Pauline if you can spare an hour or so. Remember all helpers get a free run at our Saturday events. SYO will be holding an evening event on Wednesday 23rd May to celebrate World Orienteering Day at Loxley Common. There will be 5 courses (yellow, orange, short green, green and a 6.7km blue) catering for all ages and abilities. Starts 6-7pm. Full details here. This is a great opportunity for new people to try orienteering for the first time or encourage people who haven't been orienteering for a while back again. To encourage new participants we are offering buy one entry get one entry free to members who bring a new person along to the Loxley event. It will be great to get a good turn out as Peter Hart, Chief Executive of British Orienteering, is coming along to compete at the event! There will be a social from 7.15pm at the Admiral Nelson. Just order from the main menu at your convenience. Please email Pauline by Tuesday 22nd May at 5pm to order your map and indicate if you are coming to the social. Our next large regional event is on Sunday 10th June at Sandall Beat in Doncaster. Sandall Beat is a very flat runnable woodland very unlike the majority of Sheffield areas! There will be a full range of courses from white to blue. Assembly will be located in a lovely grassy area with the start, finish and parking all adjacent. More details here. There is no need to enter in advance - just turn up on the day. We hope to see as many of our juniors taking part as possible. The new hoodies have arrived and will be available for collection from Imogen and Euan at the Millhouses event. 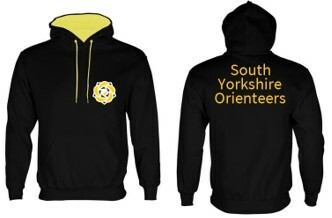 They will also have some hoodies for sale - £19 children's sizes, £22 adult's sizes. Many thanks to Lynden Hartmann who has volunteered to take on the position of event officials co-ordinator. She will be responsible for appointing people to fulfil the role of major officials at our many club events. It would be fabulous if we could support her in this role by volunteering to fulfil some of the outstanding positions. Please email Lynden if you can help. The prize giving for the 2017/18 league will be held at Cliffhanger in Devonshire Green on Saturday 7th July in the afternoon. Attendees will be able to have a go at the free maze. There will be prizes for the first 3 boys & girls in each age class, the first 3 year group teams in each class and the first 3 schools in the primary and secondary categories. There are also prizes for children that have attended all 9 events and certificates for those that have completed 5 events. Members are awarded points for participating or volunteering at SYO events and a free t-shirt will be presented to those amassing 20 points. Anna Todd will gain her 20th point at our Millhouses event on Saturday and will be presented with her new top! The next coaching session is 1-2.30pm on Saturday 9th June at Hesley Scout Camp. This is a great area, similar terrain wise to Tankersley. We are also hoping to hold a session on Sunday 15th July at West Haigh subject to permissions. These sessions are free to members and there are range of groups catering to different ages and levels of experience. The session on the 4th July will be run by GB orienteer Cat Taylor, who has recently finished 5th in the middle race at the European Orienteering Championships. 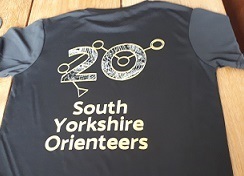 A large contingent of SYO members travelled to Wass in North Yorkshire for the Northern Championships on Sunday 22nd April. It was another successful competition for the club with 10 members crowned Northern Champions in their respective age classes. Congratulations to Anna (W10), Freya (W12), Conrad (M12), Euan (M14), Aislinn (W21E), Amanda (W45), Jenny P (W50), Charlie A (M50), Peter G (M70) and Brian (M75) who all took home trophies. We were blessed with gorgeous weather for our first evening event of the year and we were rewarded with a huge turn out of almost a hundred participants. Ian and Monika Cooper planned a yellow course for the younger juniors, a 1 hour score and a long course which comprised of a 2.5km course followed by a score; which were all enjoyed immensely by those that took part. Thanks to Ian, Monika and also Peter Gorvett who coped admirably with the IT. The 7th event in the schools' league and newcomer series was held in the lovely Shirebrook Nature Reserve on a newly extended map. Despite the rain and the far-flung location there were an impressive 256 runs. The use of the visitor centre for registration and download was much appreciated by competitors and the organising team. The ever popular SYO refreshment stall was in situ again raising £183 for the SYO juniors. Many thanks to everyone who helped and contributed cakes, particularly the Tryners for organising, Peter Guillaume and Louise & Andy Preston for planning and Dom & Jacky for sorting the refreshment stall. We held a fabulous sunny regional event on Sunday 29th April at West Haigh. The old map has been extended to include New Park Springs which is a great addition to the area. Those that came were treated to fabulous courses on really interesting and varied terrain and a well organised assembly area with nice views. Many thanks to Colin Drury for planning, Judy and Paul Johnson for organising and Dave Peel for controlling. Most people will have heard of the new data protection regulations that are coming into force on 25th May. The SYO committee are working to ensure we are compliant with the legislation and will update you in due course.